Being a South Jersey fisherman I started making bucktails for several reasons. At the end of the day we all love to catch big fish and they don’t come often. Tying your own bucktails can certainly help give you an edge. When a person makes their own bucktails, it’s easier to match the hatch . It’s extra special when you see your family, friends and youngster’s catching fish on something you have created. I am very thankful for learning the art of bucktail tying. I encourage others to try it out. I caught well over 100 keeper flounder last season. 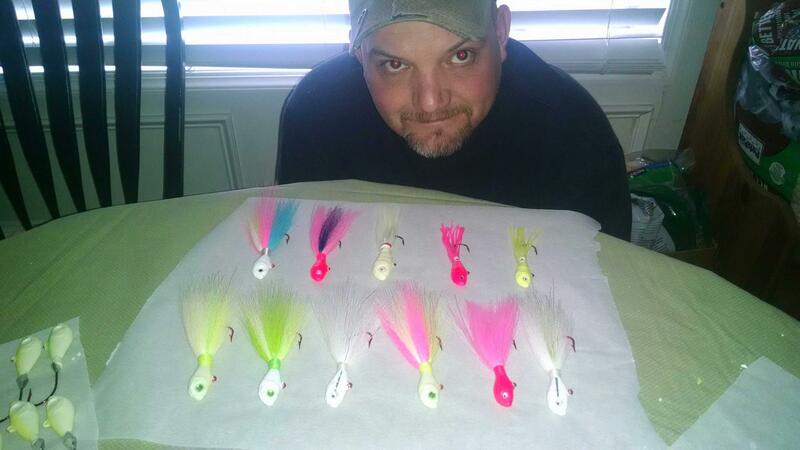 All of them were caught using a very detailed constructed bucktail and rig. This makes a tremendous difference in a flounder’s response, when he sights the lure. Chip Gruff is a very successful salt water fisherman. He has won and placed in numerous tournaments. Summer flounder being his forte. His custom bucktails contain details that will increase the catch rate significantly, over common store bought bucktails. Chip is the executive chef at Key West Tacos in Cape May, NJ. If you are in Cape May, stop in and say hello to Chip. The food is excellent.. You will also find an assortment of Chip’s extra bucktails for sale. I like Key West tacos! how much are the bucktails?